WASHINGTON, DC -- Russian tanks and heavy military equipment have crossed the Ukrainian border in the last few days in breach of a European-brokered ceasefire agreed on Feb. 12, a senior U.S. State Department official said on Tuesday. Russian T-72 tank in Ukraine. The comments by U.S. Assistant Secretary of State for Europe, Victoria Nuland, follow accusations by Ukraine and Western governments that Russia continues to send troops and weapons to support separatists in eastern Ukraine despite the Minsk ceasefire deal, a charge the Kremlin has denied. Eastern Ukraine and Crimea, the Black Sea peninsula annexed by Russia a year ago, was "suffering a reign of terror," Nuland told a congressional hearing on Ukraine, adding that the White House was still considering whether to arm Ukraine's military. 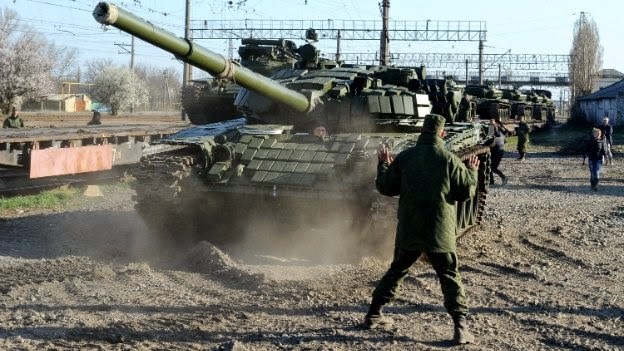 The last few days have seen new transfers of Russian tanks, armored vehicles, heavy artillery and rocket equipment over the border to the separatists, Nuland told the Senate Foreign Relations Committee. She said "hundreds and hundreds" of Russian troops had been killed during the conflict in eastern Ukraine. "In the coming days, days not weeks, we need to see a complete ceasefire," Nuland said. "Pressure is going to have to increase if Minsk is not implemented." She said there was a "spirited" debate within the administration on whether to send arms to Ukraine. Brian McKeon, the U.S. principal deputy under secretary of defense, told lawmakers 11 Russian battalion tactical teams were in Russia's Rostov region across the Ukrainian border. The United States pledged $118 million in non-lethal assistance to Ukraine but has delivered only about half of that, he said. "It's a case of finding it in the stocks of the United States military, and in the case of some equipment we're purchasing it off the production line." The Senate and House of Representatives unanimously passed legislation in December that authorized sending arms to Kiev. Obama signed the measure into law but it gave him leeway over whether or when to send the arms. In a letter to U.S. President Barack Obama on Monday, senators Bob Corker, a Republican from Tennessee and Robert Menendez, a Democrat from New Jersey, called on Obama to immediately submit a report to Congress on plans for providing arms to Ukraine. The lawmakers said the report, required under the Ukraine Freedom Support Act, had been due on Feb. 15. It was unclear when the report would be submitted.